with the durability that delivers value. In Norway, the Dale brand has been synonymous with superior quality for well more than a century. 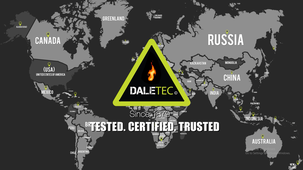 Over the past 40 years, since inventing FR work wear fabrics for the North Sea oil industry, Daletec has become a worldwide leader in flame retardant fabric and protective workwear fabrics. Our pioneering research has led to on-going innovation for the unique Daletec products now used in energy, electrical, metal and other heavy industries in more than 100 countries. A partner who pioneered the FR fabric industry and continues to lead in innovation. A broad array of lab-tested, field-proven, market-preferred, certified fabrics and finishes – in stock to cut your lead times. A team of expert textile engineers developing new materials for our customers’ specific needs. Guaranteed access to the highest quality raw materials, including the best cotton in the FR business. Tough, durable clothing, with protection that outlasts the garment, to give you the best value. Environment-friendly manufacturing, and skin-friendly treated fabrics. Global reliability, with regional logistic strengths. The most stable quality levels in the business. Daletec offers a wide range of FR fabric solutions complying to both European and Global Standards. If you have any queries, you can reach out to us at info@www.daletec.com. #Daletec (A well-known FR Fabric supplier company) want people to be aware of how you can repair FR Fabric.